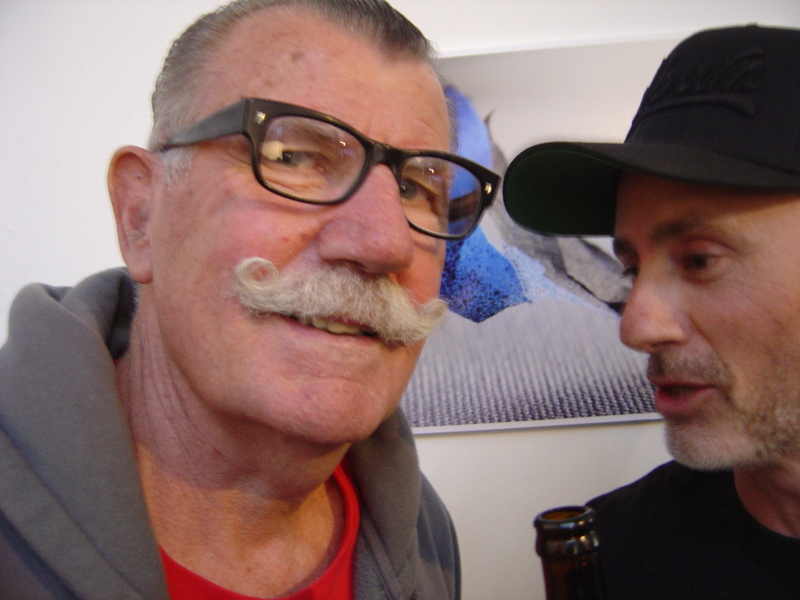 On Friday evening there was the opening of Casey Jenkins’s “True Colours” at Dark Horse Experiment. Described as a “mind altering, body modification, transformative, durational performance artwork” it is basically about if Jenkins develop synaesthesia through training. Jenkins is planning to train her brain for five hours a day for two weeks followed by a second MRI to see if anything has actually changed in her brain. In this respect it seems more like a comment on how boring jobs alter your brain than an examination of if colour perception is biological or cultural. Which of the traditions of performance art was Jenkins following with this work? The self-harm of Marina Abramović and Chris Burden or the simply the boredom of Duchamp’s Monte Carlo roulette system? It was definitely not in the entertaining tradition of performance art, nor as confronting as Jenkin’s earlier pieces. It was rather like talking about your science project at a cool party. The thing about contemporary art, that is not explained often enough, is that it is one big party: booze, finger food and gossip. Someone should write a social column about the gossip. And I have to admit that I was there more for the social scene than the art; when I really want to look at the art I don’t go to the exhibition opening. I hadn’t seen Drew Funk in years, he is back from KL and I could hardly recognise him without his dreadlock. Except for Ha-Ha, the intellectual featherweights that I was hanging out with did not engage with the exhibition’s theme. I did learn that Ha-Ha’s perception is far more focused on numbers than mine; counting the number of cuts that he makes in a stencil, seeing numbers in shapes. I didn’t want to say much because it felt like revision of all the philosophy papers that I have read about colour perception. I was also there to see the new location for Blender Studios and Dark Horse Experiment. The last time that I saw it, they were in the Docklands and now they are in West Melbourne. It is more like the original Blender Studios; an old factory with exposed struts supporting the roof. Entry is down an alley, its flagstones covered in aerosol paint from the children’s spray painting classes that they run. And it still has that blend between street and contemporary art. 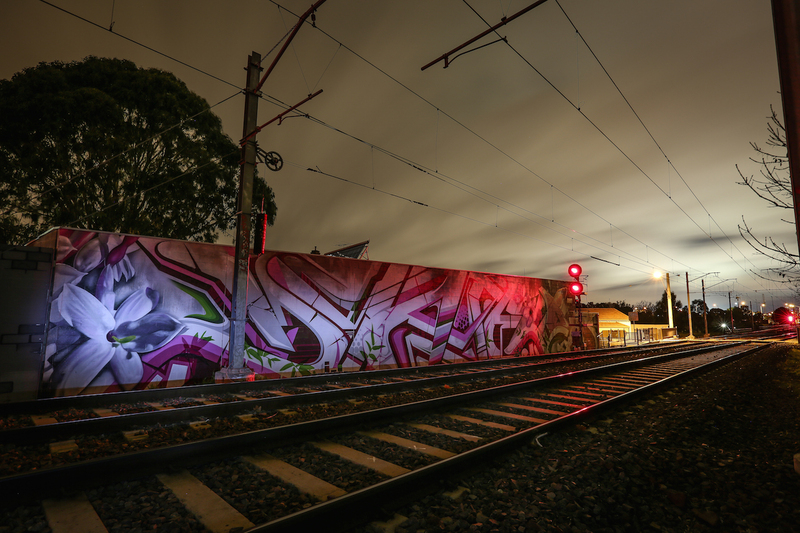 Jamit was planning to buy some spray-paint at Giant in North Melbourne and I agreed to walk with him. We started at the front of the State Library. When I got there I found that there was an Indonesian artist, Tiana Sanjaya was setting up to paint with spices. Tumeric, candlenut, horseradish, mustard seed, nutmeg and chilli; it smelt good. It was part of the AsiaTopa 2017, the Asia-Pacific Triennial of Performing Arts. On the way we had a look at Blender Lane. Now that Blender Studios has closed I was wonder if the quality of the work in the lane will continue without Doyle being present? 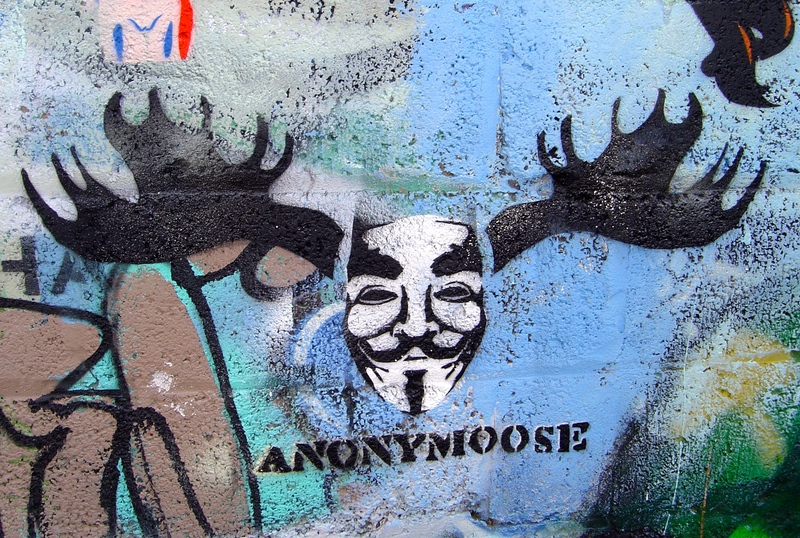 Further to that subject, we also looked at the graffiti and street art in Lovelands, a series of lanes near Victoria Market carpark, near the corner of Queen and Franklin Street. It also has the same questions of redevelopment hanging over it. It doesn’t look like much has changed since I saw Itch painting last year during the Meeting of Styles. We passed another lane painted during the Meeting of Styles in April 2016 but there is more to see on the streets than just graffiti and street art. I am not just looking at graffiti and street art; I have other interests, like public sculpture. Outside School No.307 on Queensberry Street I stop to look at a Peter Corlett sculpture of Henry Barstow. Henry Barstow was the architect who designed many state schools. I hadn’t seen the sculpture before but this is not surprising given Corlett’s prolific production creating several figures each year. Finally we reach Giant in North Melbourne. Maybe we should have taken the tram but the walk has been worthwhile. Nth Melbourne is a long thin suburb and its geography of Nth Melbourne is disorientating because the streets are not aligned to the same axis as the grid of Melbourne’s CBD. “Hello Mark” is the first thing that I hear. At first I can’t see who is speaking because there is a big dude between me and the voice. It is Toby who runs Just Another Agency. Everywhere I go I run into people that I know, a bonus for writing this blog. Jamit buys about two dozen cans and even though the cans are cheaper by the half dozen he doesn’t walk away with much change from $150. 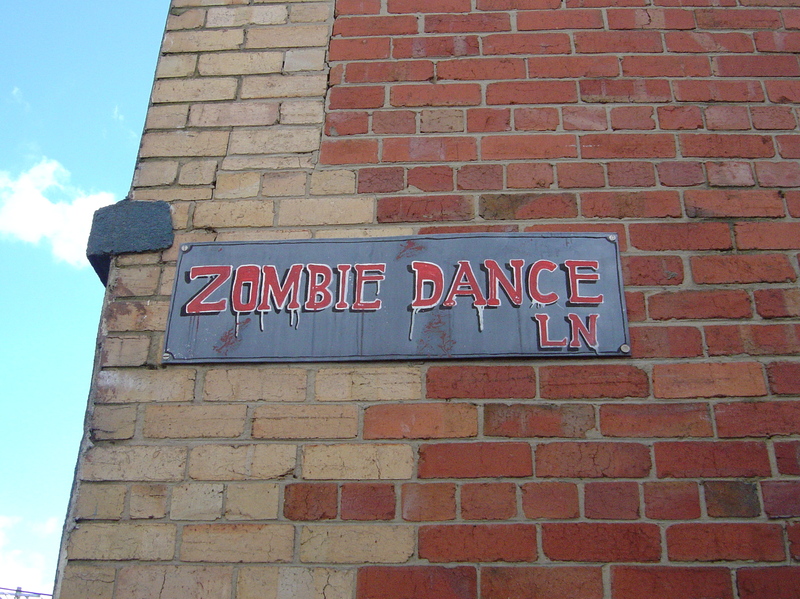 You won’t fine Blender Lane, Chook Alley or Zombie Dance Lane on any official map of Melbourne but all these locations do have handmade street signs attached to a neighbouring wall. 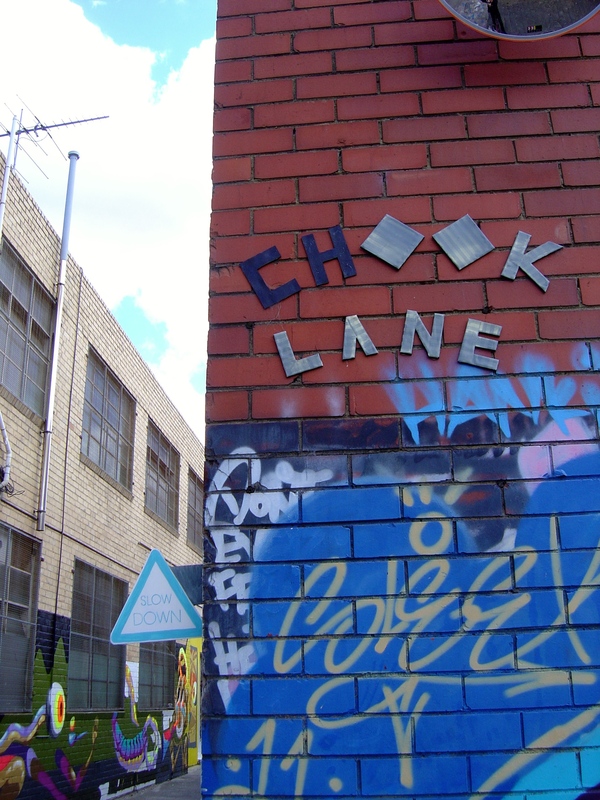 I can give you directions: Chook Alley is off Ilham Lane in Brunswick. Ilham Lane was only named in the last decade by the Moreland City Council, after John Ilham, the founder of Crazy John’s, the mobile phone dealers. There are practical reasons for naming every little alleyway in the city, especially in providing accurate directions in emergencies, so I hope that someday these pieces of guerrilla geography will become official. 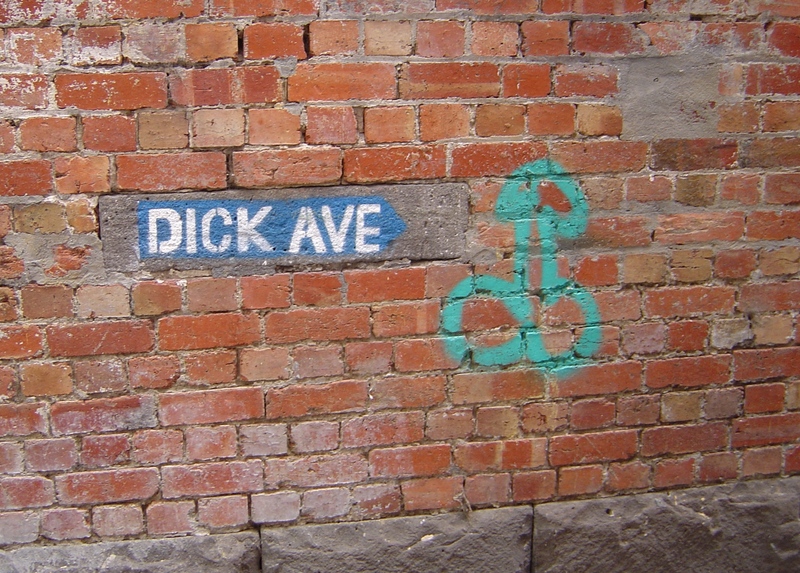 These acts of guerrilla geography (a term to go with ‘guerrilla gardening’) are all associated with Melbourne’s street art (‘guerrilla public art’). Blender Lane is named after the next door Blender Studios that also runs street art tours and workshops. 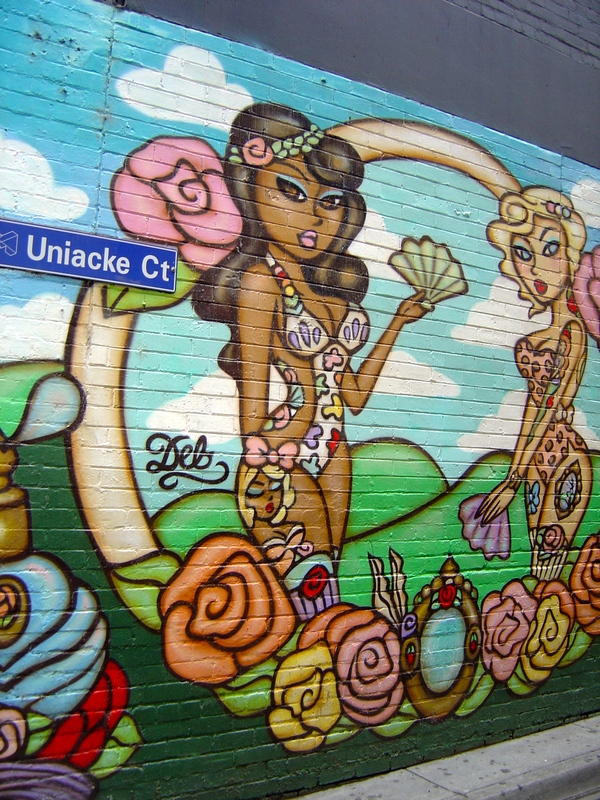 Both Blender Lane and Zombie Dance Lane have a large amount of street art and graffiti and Chook Alley comes off Ilham Lane which has some street art, along with an art gallery and studios. In the 1950s the Situationalists advocated the renaming and reimagining of buildings. Can you imagine the front of the NGV as the entrance to a train station? If you can’t see the B-grade movie I, Frankenstein. Location scouts for movies are a crypto-Situationalists but other people really do reinventing buildings, turning a factory gatehouse into a coffeeshop, warehouses into apartments. Walking around Melbourne exploring its many lanes, sometimes in the company of a notable, some would say notorious, street artist who would prefer to remain anonymous and keep his comments off the record. Thanks for the company. What follows are my photos, my comments and my opinions. The selection of photos is not my pick of the best street art that I’ve recently seen but to the diversity, both geographic, technique and materials, of Melbourne’s street art. None of these photos are from the old locations, Hosier Lane, Centre Place, they are no longer the best place to see street art in the city. 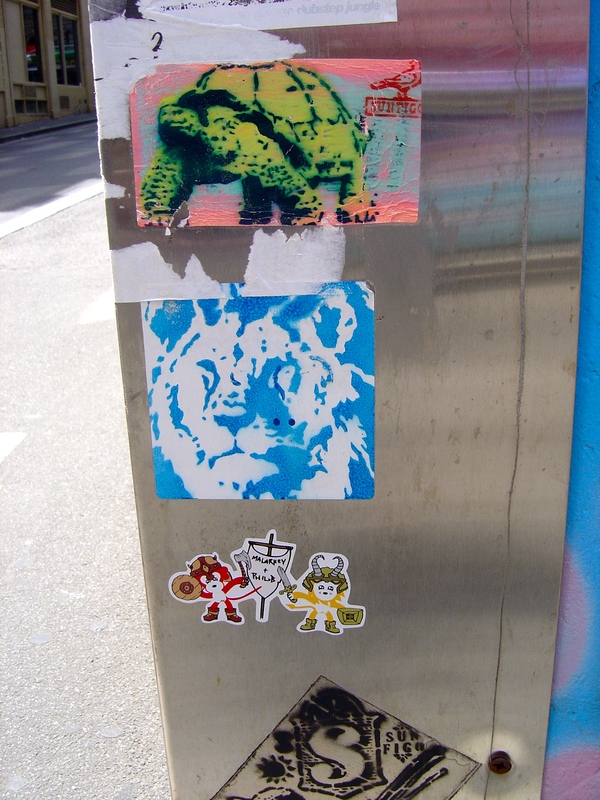 The locations for good street art have shifted in the eight years that I have been writing this blog, slowly moving north and west. In the west of the city where the street art is scare I found a whole lane, Uniacke Court, with several pieces by Deb and no-one else. All over the city I keep on seeing more and more of the work of Sunfigo, simple and effective stickers and paste-ups but nothing to compare to Sunfigo’s Little Diver Tribute. 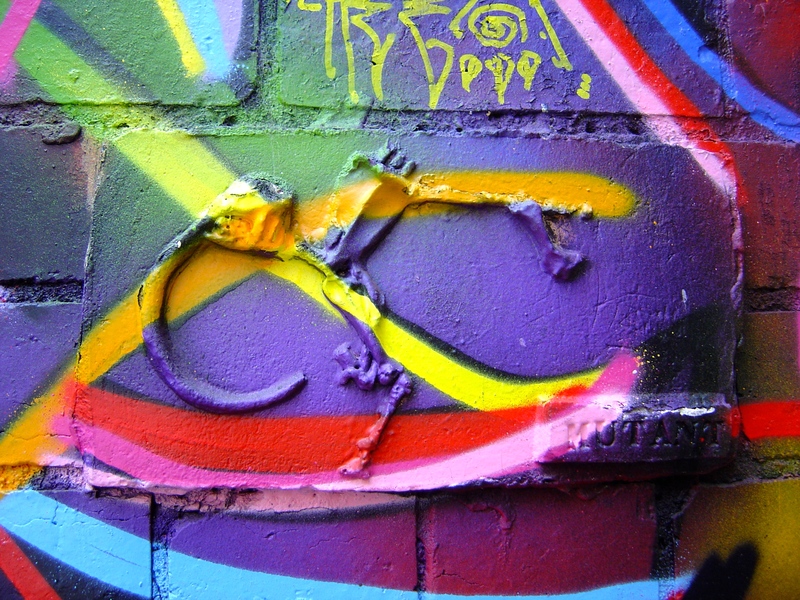 If you love stencils the best place to see them is Blender Alley. The reason is that the main door to Blender Studios, its roller doors were open when I was there, faces the alley and the artist’s in the studio, especially its director, Doyle, basically curate the alley. 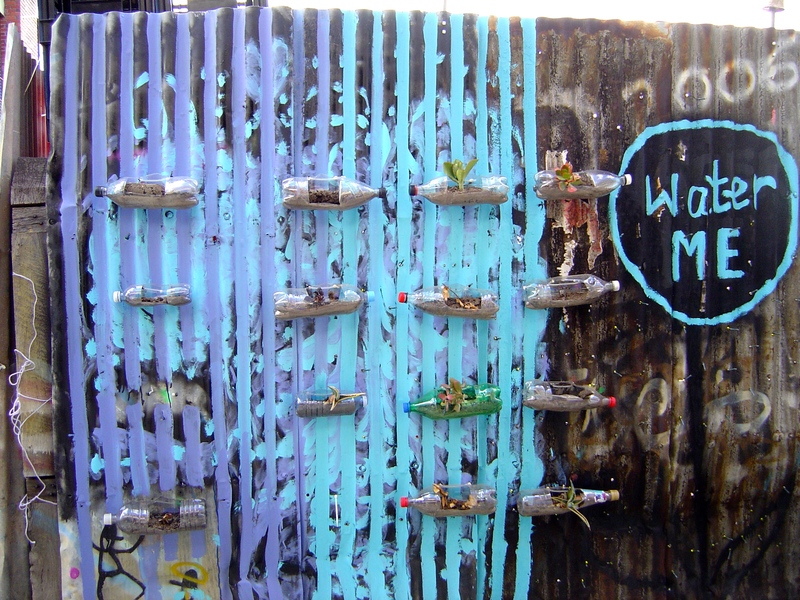 I keep seeing more street art sculpture and, not just Will Coles and Junky Projects, more people are doing it. Mutant and Discarded are doing similar work casting bones and other found objects. So far I have only seen Discarded’s work online but I know that it is out there. 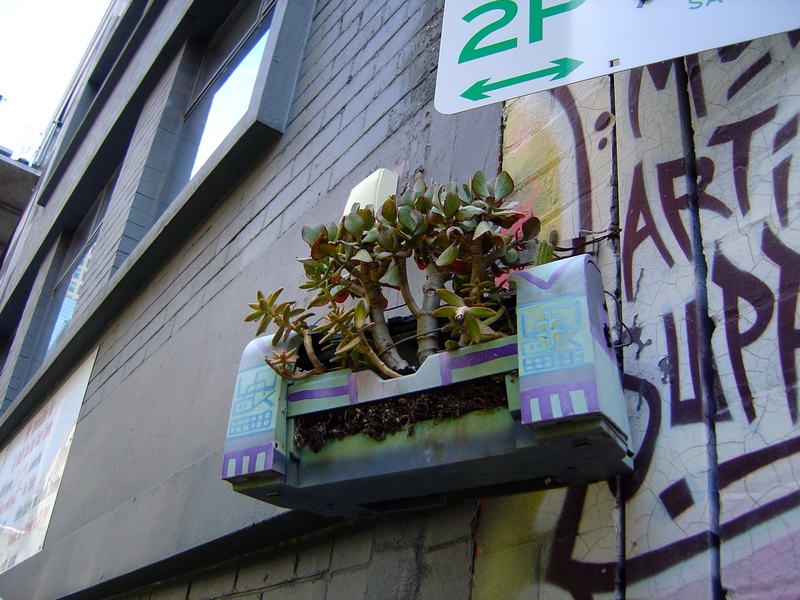 I’ve seen a few more artistic works of guerrilla gardening in the city and Ilham Lane in Brunswick. 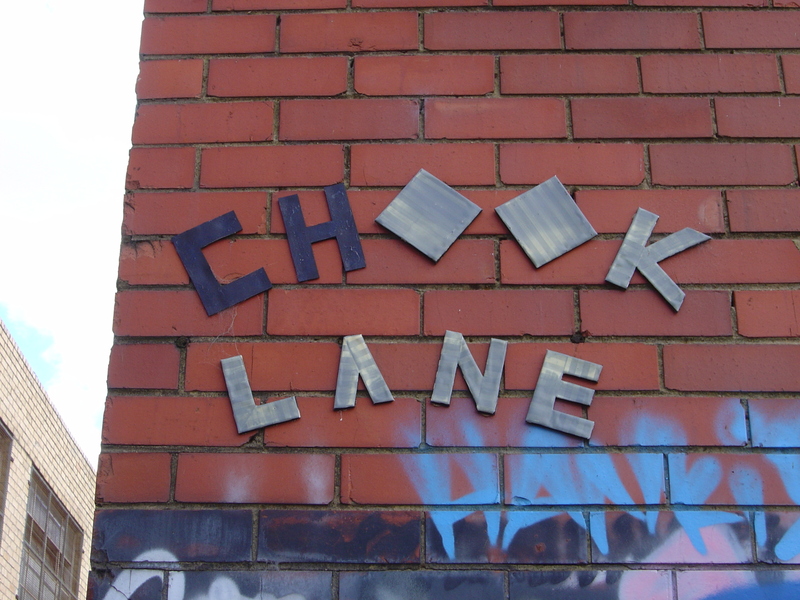 Also in Ilham Lane there is a piece of guerrilla geography, naming the small side bunch from Ilham Lane, Chook Lane. 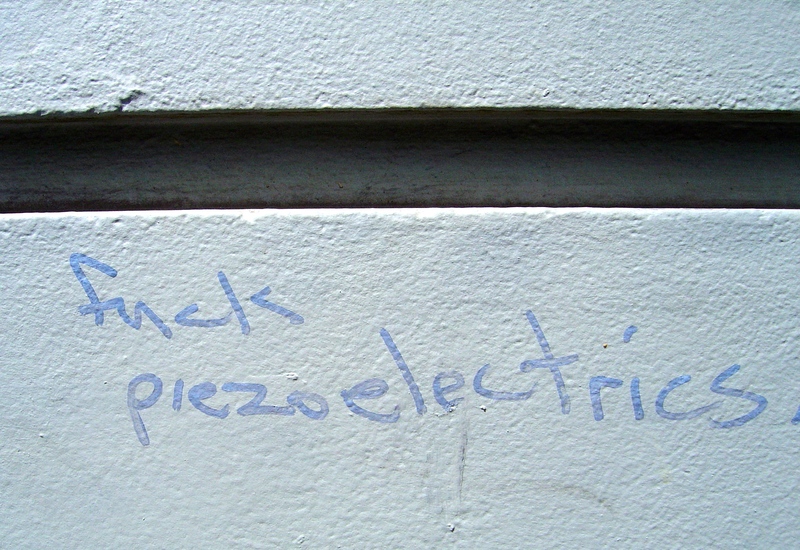 And there is still basic graffiti out there.